Chelsea, Arsenal to battle it out for Real Madrid star? 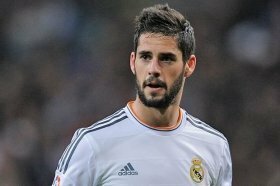 Premier League giants Chelsea and Arsenal could reportedly go head-to-head to secure the signature of midfielder Isco from Real Madrid during the winter transfer window. The Spain international is understood to be weighing up his future at the European champions after failing to earn a single league start since Santiago Solari became the club's head coach. According to The Mirror, both Chelsea and Arsenal are having the midfielder at the top of their transfer shortlist for the New Year and they could go on a bidding battle to acquire his services. Nonetheless, the Gunners are said to have the slender advantage over the Blues in the player's pursuit with Isco having previously worked under Emery during their time together at Valencia. Isco, who has more than three years left on his existing deal, had previously been linked with the likes of Manchester United, Manchester City and Tottenham Hotspur amid the uncertainty which was present during Zinedine Zidane's time at the helm.